Dreamcatcher – Some consider the dreamcatcher a symbol of unity among the various Indian Nations, and a general symbol of identification with Native American or First Nations cultures. Dreamcatchers are an authentic American Indian tradition from the Ojibway (Chippewa) tribe. A dreamcatcher is a based on a hoop (traditionally of willow), on which is woven a net or web of sinew in a somewhat similar pattern to how the Ojibway tied webbing for snowshoes. A “dream-catcher” was hung in the sleeping area as a charm to protect children from nightmares. A legend holds that a dreamcatcher filters a person’s dreams, letting through the good ones and trapping bad dreams in the web. Some believe that a dreamcatcher can help us remember our dreams. Dreamcatchers are often decorated with personal and sacred items such as feathers, totems and beads. 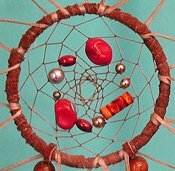 While these additions may make a dreamcatcher appealing and add to them as a work of art, it is suggested by some that such ornaments are not appropriate on dreamcatchers used for “catching dreams” as they could interfere with the spiraling motion of the web and can cause disturbing dreams. Generally, a dreamcatcher is suspended near the place where you sleep, on the wall, or perhaps from a lampshade or bedpost. Mandala – Sometimes misspelled mandalla or mandella, it is from the Sanskrit, circle. A mandala is a circular image or item with ritualistic geometric designs that link to and are symbolic of the universe. Used mostly in Hinduism and Buddhism, a mandala is similar to a dreamcatcher but it has no web. Instead, the circle is filled with designs or can be filled with yarn, feathers, fur and usually has feathers hanging from the bottom. A mandala is something you use as an aid in meditation or hang for prosperity and good fortune on a door or wall inside your office, home, hogan, or tipi.